With the painted objects frontally lit, the transition from clarity to obscurity within this picture is also a journey from surface into depth, drawing us from the superficially self-evident towards unfathomable darkness. 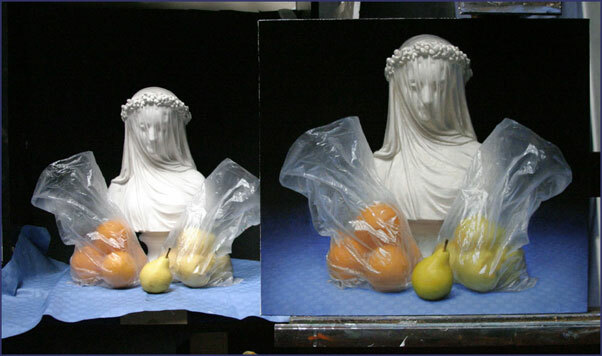 The bags are painted quite texturally with crisply impasted lights and something like a physical approximation of the thin plastic. 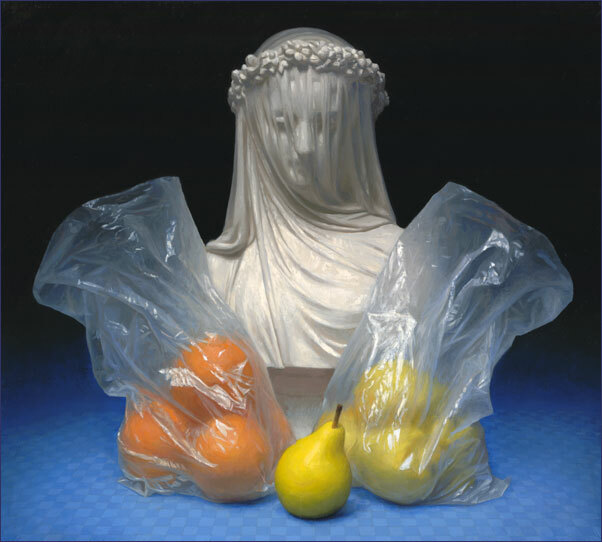 What's in the bags is barely indicated, but because the surface of the bag and the effect of light transmitted through it is so truthful, I think the viewer will tend to accept it as a convincing token of the riches contained within. I believe the original marble bust is called 'Veiled Lady', circa 1860, by Raffaelle Monti (mine is a plaster copy). Sculptures of this sort have long been popular because they display such virtuosity in their surface effects. These effects are deployed in a complex, almost painterly way, using the play of light and shade over the form to create an illusion of translucency and of a surface beneath the surface. The veiled figure thus reinforces my reflection on painterly virtuosity and the play of surface against depth within the painting ? a 'doubling' which emphasises that this play is not an accidental feature of the picture, but its principal theme. Placed centrally and facing the viewer, she is also a sort of mirror-image of the beholder, a reminder that for us perception is inevitably clouded, that our struggle to separate appearance from reality is never complete.